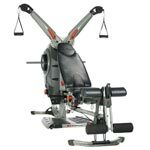 The Bowflex Ultimate 2 is the most comprehensive Bowflex home gym in their lineup of home gym products. It comes with 95 strength building exercises and a calorie-burning cardio rowing feature gives you a complete full body workout. 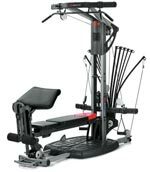 It offers up to 310lbs of power rod resistance, and comes with a lat tower, preacher curl attachment, squat station, leg extension attachment, and much more. With the Bowflex Ultimate 2 home gym, you can perform most of the exercises available from your local gyms all in a compact space within your home. The simplicity and ease of use of the Bowflex is unparalleled comparing with any other home gym on the market. The vast variety of workout exercises plus a built in cardio rowing station provides the user with a wide choice of workouts. Bowflex Ultimate 2 Power Rod units give you resistance, or weight, that feels as good as free weights but without the inertia or risk of joint pain usually associated with free weights. The standard 310lbs resistance is upgradeable to 410 lbs. 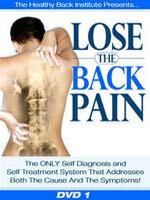 You are able to easily move from squats to lats to leg workouts without ever changing cables. This saves you save time and keeps your heart rate up as you progress through your workout. 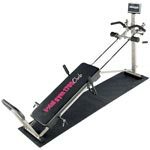 The above just lists some of the available exercises with the Bowflex Ultimate 2 home gym - many more exercises are not listed in the above list. The Bowflex Ultimate 2 home gym is a superior product, and Bowflex provides a guarantee that stands behind it. Your satisfaction is guaranteed. Just purchase your machine and workout for up to six weeks. If you're not 100% satisfied with the results, simply contact the Bowflex customer service department for Return Authorization.